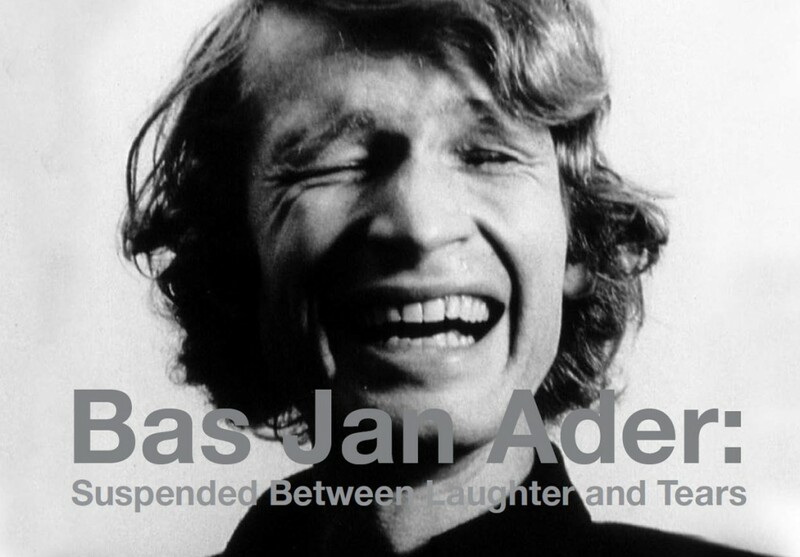 Suspended Between Laughter and Tears is an exhibition of video, photography, installations and archived materials from the estate of the late Dutch-born and California-based conceptual artist Bas Jan Ader, who is assumed to have perished at sea in 1975. The exhibition’s title refers to the artist’s exploration of the tenuous point between comedy and tragedy in his work. It is the first large-scale survey focusing on the breadth of his artistic practice mounted in the United States in over 10 years and will include documentation of works that have previously only been seen in catalog reproductions. A publication will accompany the exhibition and will include interviews with Ader’s widow, Mary Sue Anderson. Ader’s work centers on short-duration acts of physical and emotional release. In the noted film and subsequent photographs titled I’m Too Sad to Tell You (1971), the artist is seen crying directly into the camera amplifying a simple human emotion – grief – into a profound and revelatory experience. Ader also makes use of the force of gravity as a medium in his performance work, as documented in film and photography. His videos, in many respects, bear an explicit physicality, which are the hallmark of many silent films. Other projects, including the unfinished trilogy In Search of the Miraculous (1975), during which the artist disappeared, stretch the boundaries of sentimentalism through existential journey. Ader frequently referenced Dutch artistic and cultural traditions in his work. Photographs such as On the road to a new Neo Plasticism, Westkapelle, Holland (1971) reveal his interest in Mondrian and the De Stijl movement, which sought simplified compositions to express a utopian harmony. Dutch landscape and still life painting traditions can be seen in videos such as Primary Time (1974), in which the artist arranges and rearranges a red, blue and yellow bouquet of flowers, and in photographs like Farewell to Faraway Friends (1971), where the artists casts himself as a romantic wanderer – linking himself to the paintings of 19th century German artist Caspar David Friedrich – but ultimately setting the tone for his physical acts of searching. Yet it was Ader’s unique relationship to the city of Claremont, where he lived and studied from 1965 to 1974, which established his importance as a California artist. At his Claremont home, Ader executed some of his most significant works including All My Clothes (1970) and Fall I (Los Angeles) (1970). In his Claremont studio he also produced the experimental installations Please Don’t Leave Me (1969) and Reader’s Digest Digested (1970). His thesis exhibition at Claremont Graduate University in 1967 laid the groundwork for his mature works, as seen in the offset lithograph invitation to the show depicting Ader sitting on the roof of his home smoking a cigar with cartoon-like clouds and sky behind him. Ader’s modest body of work – considered groundbreaking and visionary – continues to influence a new generation of artists. Suspended Between Laughter and Tears provides a context for his overarching themes and strategies by addressing the living aspects of his practice. In addition to Ader’s original works of art, the exhibition includes specific pieces by artists that reference his concepts and actions. For example, Sebastian Stumpf, from Leipzig, Germany, pays homage to Ader by attempting to overcome gravity instead of succumbing to it in works such as Marcher á l’envers. Los Angeles-based, Mexican-born artist Fernando Sanchez explores the idea of failure and an inability to conquer natural forces through a series of live and web-cast performances. Understanding that comedy and tragedy are two sides of the same coin, Mexico City-based artist Artemio, references Ader’s I’m Too Sad to Tell You in his video montage The Crying Game where the forced act of weeping in front of the camera lingers between the theatrical and the heart-felt. Photographer and performance artist Martin Kersels, from Los Angeles, plays off of the humor of physical action seen throughout Ader’s work, in his body of photographs Tripping. Katie Newby of Auckland, also brings a delicate balance of melancholy and hopefulness to her temporary installations that, like Ader’s Please Don’t Leave Me, are at once a declaration to be noticed and a fleeting gesture. Yet the most influential aspect of Ader’s work seems to lie in his final and incomplete trilogy, In Search of the Miraculous. The notion of perishing while attempting something meaningful in art, or the ultimate sacrifice for one’s craft, is a concept that young artists have gravitated towards again and again. Disappearing without a trace, as Ader did while executing this piece, seems plausible in the pre-GPS era of the 1970s, yet Piero Golia (Naples/Los Angeles) accomplished this feat in 2007, and lived to tell the story in his month-long performance Postcards from the Edge. Gonzalo Lebrija, from Guadalajara, follows in Ader’s footsteps on a vision quest in the photographic series The Distance Between You and Me, as he sets a lone course through deserted landscapes. Furthering the mystery of a journey on the open ocean, Rio de Janeiro artist Thiago Rocha Pitta elicits the relationship of man, the sea and the unknown elements at hand in the video The Secret Sharer. In a marked attempt to gain insight into the artist’s impossible journey, Canadian sculptor Jed Lind acquired a sailboat identical to that used by Ader in his 1975 performance, In Search of the Miraculous, and hollowed it out in a painstaking and methodical act of meditation. Mexico City artist Diego Teo also suggests that an homage to this work must include the ideas of fleetingness and futility, such as in the artist’s own attempt to mark the cultural terrain of a graffiti pit with the title of Ader’s work, only to have it obliterated moments later by a wave of new imagery. Furthermore, a special screening of Dutch filmmaker Rene Daalder’s documentary on Bas Jan Ader, Here is Always Somewhere Else, will take place during the course of the exhibition. Daalder will also present a selection of videos by contemporary artists utilizing gravity in their work. Opening Reception: September, 30, 2010, 5-8 p.m.